Some of these matches will be really clipped as eight matches is a ridiculous amount for a two hour televised show, but the main matches will likely all be shown in full or really close to it. Let’s get started. We kick off the show with a fun opener with random young wrestlers and a couple veterans to keep things under control. Natsumi and Anou are from Actress girl’Z, while Starlight Kid is the newest young wrestler in Stardom. On the other team, Azumi is the youngest roster member of Stardom while Kato and Yoneyama are established midcard vets. I predict this will be clipped all to hell but hopefully we get to see something from the young Actress girl’Z wrestlers. Azumi and Starlight Kid kick things off, they bounce off the ropes a bunch and both go for dropkicks with no luck. Azumi dropkicks Starlight Kid from behind so she tags in Natsumi, Natsumi works the arm of Azumi, but Azumi reverses it. Yoneyama and Kato come into the ring and triple team Natsumi, Yoneyama stays in the ring but Natsumi flips her to the mat. Spinning headscissors by Natsumi and she tags in Starlight Kid, she tosses Yoneyama to the mat before tagging in Anou. Anou tries the same but Yoneyama blocks it, Anou gets Yoneyama to the mat and applies a bridging leg lock while Starlight Kid and Natsumi pose nearby. Kato and Azumi run in to help, we clip ahead in the match to Starlight Kid dropkicking Yoneyama. La Magistral by Azumi to Starlight Kid, she kicks out, but Azumi quickly applies a rolling foot cradle for the three count! Azumi, Kato, and Yoneyama win the match. They actually showed a bit more of this match than I was expecting, but still not a lot was shown. It was fun seeing the Actress girl’Z wrestlers though, always enjoyable to see some new younger wrestlers. Not enough substance here to get a good feel of the match but what they showed was fine. The “other” Chelsea is back to face one of the new wrestler in Stardom, Mimura! Mimura debuted last fall at the age of 29, her debut was delayed due to an injury. She fits right in though as she loves dancing and being adorable. Green you may remember as being in the last version of Tough Enough, and she trained under Lance Storm. This is the first of many matches that will fit under the Stardom vs. World theme. Mimura attacks Green with elbows but Green withstands them and takes her to the mat. Mimura stomps on Green’s foot and jumps on her back to apply a sleeper, but Green flings her off. Mimura tries a few quick pins with no luck, knee by Green and she stomps Mimura in the chest. Jumping double footstomp by Green and she covers Mimura for three! Chelsea Green wins! Not a whole lot to this, it was a short match that was clipped even further. Mimura never had any chance of winning as her flash pins weren’t having any luck, and Green won the match really easily (or they clipped the build-up). The finish didn’t look great and overall it was pretty lackluster. It seems that Cat Power now follows me wherever I go, she is an unexpected participant on this card. Watanabe has a new outfit so perhaps she has ‘graduated’, she has been wrestling for over a year now so with all the new rookies maybe it was time for her to upgrade. She still likely will lose this match but still it shows some signs of progress in her career. Cat Power looks really different, I am just assuming it is her since that is what the match listing says. Watanabe tries working on Cat Power’s arm but Cat Power shrugs it off, Watanabe goes for a dropkick but Cat Power swats it away. Cat Power stomps on Watanabe’s head and hits a lariat, she puts Watanabe in a Texas Cloverleaf but Watanabe gets to the ropes. Anaconda Buster by Cat Power, she picks up Watanabe and hits a lariat in the corner. Cat Power throws Watanabe in the corner but Watanabe jumps up in the corner and hits a missile dropkick. Somato by Watanabe, but Cat Power kicks out of the cover. Knee by Cat Power and she throws Watanabe hard into the corner. Hurricane Driver by Cat Power, and she picks up the three count! Cat Power is your winner. Like the last few (and probably the next few) this was a basic match, it only went six minutes but was clipped down further than that. If Watanabe has a new attitude she didn’t get a chance to display it here as Cat Power was simply too much for her. Cat Power being on a Stardom show surprised me as normally she Freelancers elsewhere, it will be interesting to see if this leads to a longer stay or they just needed a Gaijin to beat a young Stardom wrestler. I thought Cat Power looked impressive here but too small a sample size to get excited about. The theme of Stardom youngster vs. overpowering Gaijin continues, as the awesome Kellie Skater takes on the rookie Kyouna. Kyouna has quickly placed herself at the top of the rookie class, which is probably why she is going last, and has the highest chance of sneaking out a victory (even though it isn’t likely). Skater is one third of the Artist of Stardom Champions going into the match so she has some recent accomplishments supporting her, and she last defended her title on January 24th. Let’s hope this one gets a bit more airing than the last few matches. We join this one in progress as Kyouna throws Skater into the corner before hitting a face crusher. Camel clutch by Kyouna but Skater gets out of it and applies an ankle hold. Skater stomps on Kyouna and kicks her repeatedly, knee by Skater in the corner and she covers Kyouna for two. Kyouna blocks a slam and hits a back bodydrop, powerslam by Kyouna but it gets two. Kyouna goes to the second turnbuckle and hits a diving body press, but Skater kicks out again. Kyouna goes all the way up this time but this time Skater is up and tosses her to the mat. Leg drop by Skater, she picks up Kyouna and nails a kick to the head. Skater picks up Kyouna but Kyouna pushes her off and hits a lariat. Kyouna goes off the ropes but Skater connects with a superkick, Cross Arm Russian Leg Sweep by Skater and she gets the three count! Kellie Skater is the winner. Kyouna did get in a bit of offense here or there but it still never reached the point that it felt like she may win. Skater looked good as she always does, but the match was a bit clipped so it was a bit disjointed. I did like Kyouna hitting some of her moves, this was certainly not a squash as she got in quite a bit of offense, but Skater was always ready to kick her in the head when needed. The best match of the card so far and above average overall, but due to its length not something worth going out of your way to see. The Stardom vs. World trend continues, even though Matsumoto is technically a Freelancer she does wrestle in Stardom quite a bit and is a currently a third of the Artist of Stardom Champions. This is a big chance for the Canadian star, as while Matsumoto is hard to beat it will likely still be a fairly back and forth match as it wouldn’t be as important for Stardom to protect a Freelancer. 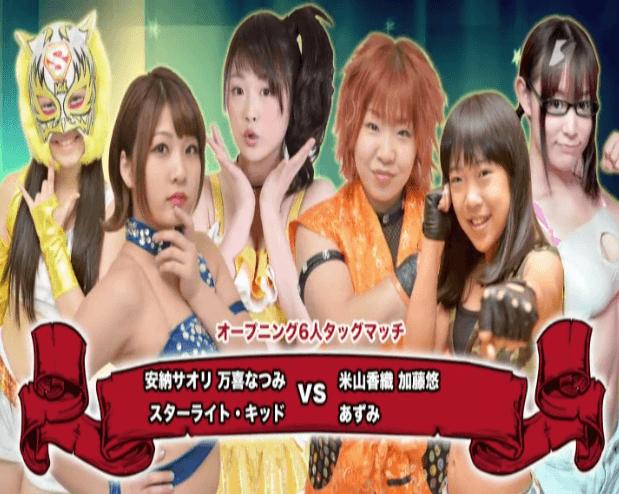 This is the first Stardom vs. World match where the Stardom wrestler would be favored, so it looks like the home team will finally get a chance to notch a win. They start with a test of strength, Matsumoto gets the better of it and she shoulderblocks Diamond to the mat. Diamond comes back with a choke but Matsumoto elbows her and tosses her in the corner. Diamond throws the referee at Matsumoto and chokes her with a shirt, side Russian leg sweep by Diamond and Act helps her choke Matsumoto in the ropes. Matsumoto snaps Diamond’s neck on the to rope, Act pours sake on her but Matsumoto spits the sake back at Act. Matsumoto gets Diamond up in the Argentine Backbreaker before slamming her to the mat, cover by Matsumoto but it gets two. Matsumoto gets on the second turnbuckle but Diamond gets her knees up on the Reverse Splash attempt. Diamond picks up Matsumoto but Matsumoto elbows her off and hits a release German suplex. Diamond blocks the lariat and hits a side slam, she picks up Matsumoto but Matsumoto gets away and hits an elbow. Matsumoto gets Diamond up and powerbombs her into the corner, backdrop suplex by Matsumoto and she gets the three count! Hiroyo Matsumoto wins! Clipping hurt this match too as the middle portion was missing, which is a shame as it looked it like had potential. Matsumoto is a solid veteran that very rarely has bad matches, and everything that we saw looked tight, especially the backdrop suplex at the end. Plus it is always a pleasure to see Act Yasukawa. I can’t with a clear conscious recommend a match that only six minutes was shown of but nothing bad here. This match is for the High Speed Championship. Now we are onto the good stuff, shouldn’t have any clipping issues going forward. Evie earned her shot at this at the last major event, when in the 5 vs. 5 match she pinned Iwatani with a TTYL, showing that she had the ability to hang with the champion. Plus she is the one third of the Artist of Stardom Champions with Matsumoto and Skater so she already has some gold in the promotion. Iwatani is perhaps the brightest young star of Stardom, as she holds two titles and has already successfully defended the title twice since winning it in October. This may be her toughest match yet though and World Selection has had the upper hand thus far on this event. After starting with wristlocks and rope running with neither getting the upper hand, they go back and forth until Evie flips Iwatani out to the apron and Iwatani does a split legged armdrag to return to the ring. Dropkick by Iwatani but Evie connects with a couple kicks and applies a stretch hold. Iwatani gets to the ropes but Evie slaps on a crab hold, Evie picks up Iwatani and Iwatani goes for a springboard move, but Evie kicks her in the head to block it. Evie gets on the apron and knees Iwatani in the head until Iwatani also falls onto the apron. Evie picks up Iwatani and slams her on the apron, sending Iwatani down to the floor. Evie slides Iwatani back into the ring and throws her into the corner, she sets up Iwatani across the ropes and hits a series of kicks before slamming Iwatani onto her knee for a two count. Evie charges Iwatani but Iwatani avoids the big boot and hits a high kick followed by a diving footstomp to the back. Iwatani picks up Evie, Evie gets away but Iwatani still hits a Northern Lights Suplex. Iwatani goes off the ropes but Evie hits a side slam onto her knee, Evie goes up top but Iwatani recovers and joins her. Iwatani suplexes Evie back into the ring, she gets on the second turnbuckle and she hits a missile dropkick. Iwatani goes up top herself and delivers the diving footstomp, she picks up Evie but Evie blocks the dragon suplex. High kick by Evie and she hits a trio of big boots in the corner, cover by Evie but Iwatani gets a shoulder up. Evie picks up Iwatani but Iwatani slides away and sneaks in a sunset flip for two. They both miss high kicks but Iwatani connects with one and hits a hurricanrana for a two count. Superkick by Iwatani and she hits two more as Evie is on her knee. Buzzsaw Kick by Iwatani, she picks up Evie and nails the dragon suplex hold for a three count! Iwatani retains her High Speed Championship. This match is for the Wonder of Stardom Championship. Garrett has not been the most active wrestler to hold a Stardom Championship, as she has only had a handful of matches since winning the title back in November from Io Shirai. But she is back to defend the Gold against crowd favorite but consistent loser Kairi Hojo. One of the storylines going in is that since winning the FIVE STAR GP last summer, Hojo has not had a lot of luck winning matches. This has led to her getting more aggressive and a bit reckless to try to end the losing streak. She has a good opportunity to end it here and win the promotion’s second ranked singles championship, but Garrett comes into the match holding five championships so she isn’t easy to beat. Hojo wastes no time as she attacks Garrett from behind, elbows by Hojo but Garrett elbows her back. We jump ahead just a little bit as Garrett goes for a sunset flip, but Hojo kicks out. Big spear by Hojo, Garrett falls out of the ring and Hojo hits a jumping forearm off the apron. Back in the ring Hojo jumps down on Garrett’s back, she goes up top and hits a diving forearm smash for a two count cover. Chops by Hojo in the corner and she heel drops Garrett in the back for another two. Stretch hold by Hojo and she throws Garrett in the corner, she goes for a forearm but Garrett slides to the apron and rams Hojo into the turnbuckles. Diving armdrag by Garrett and she hits a side Russian leg sweep for a two count. Space Rolling Elbow by Garrett and she thrust kicks Hojo out of the ring to the floor. Garrett goes off the ropes and dives out onto Hojo and others with a big tope suicida! Garrett boots Hojo after sliding her into the ring and applies an armbar over the second rope before finally returning to the ring herself. Garrett rolls onto Hojo and applies a stretch hold, Garrett releases he hold after a moment but stomping Hojo into the mat. Garrett kicks Hojo in the arm but Hojo fights back with elbows, Hojo trips Garrett and she puts her in a crab hold, but Garrett makes it to the ropes. Hojo drags her to the middle of the ring but Garrett quickly rolls her up for a two count. Garrett snaps Hojo’s arm and hits a snap suplex, she goes for the Shining Star Press but Hojo rolls out of the way. Back up they go back and forth with elbows until Hojo hits a modified Final Cut. Hojo goes up top but Garrett recovers and goes for a headscissors. Hojo blocks that however, she knocks Garrett so she is hanging from the top rope before hitting a jumping double footstomp to her chest. Cover by Hojo, but Garrett gets a shoulder up. Hojo goes off the ropes and dropkicks Garrett in the back, Sliding D by Hojo but again Garrett kicks out. Hojo puts Garrett in the cross legged crab hold but releases it after a moment, she goes up top and she delivers a diving elbow drop to Garrett’s back. She goes up top again after turning Garrett over, but this time Garrett rolls out of the way. Hojo goes for a spinning back chop but Garrett ducks it and kicks Hojo in the head. Shining Star Press by Garrett, but Hojo barely kicks out before the three count. Garrett kicks Hojo, she gets Hojo in a sunset flip and applies a rolling cradle into a three count cover! Garrett wins the match and retains the Wonder of Stardom Championship. This match is for the World of Stardom Championship. This match was set up on February 7th, when Viper pinned Shirai to win the 5 vs. 5 match and then challenged her afterwards. Shirai had to say yes of course so here we are, it helped that she didn’t really have any other challengers ready. Viper is a Scottish wrestler that is on her first extended tour in Stardom, and has already impressed enough that it was only a matter of time before she got a title shot. This is Shirai’s second title defense, after defeating Kairi Hojo on January 17th. Viper won’t shake Shirai’s hand before the match, once the match starts she tosses Shirai into the ropes before flinging her to the mat. Body press by Viper and Shirai rolls out of the ring to try to recover. She rolls back in and goes for a suplex, but Viper blocks it, Viper chases Shirai around the ring but Shirai moves and hits a drop toehold. Dropkick by Shirai, Viper falls out of the ring but she catches Shirai when she goes for an Asai Moonsault. Viper throws Shirai into the ring post, she takes Shirai up into the bleachers and puts her in a backbreaker. Viper brings Shirai back to the ringside and throws her into the ring post before sliding Shirai in the ring. Viper, Diamond, and Yasukawa all attack Shirai on the apron, Viper picks up Shirai but Shirai cartwheels away from her and hits a dropkick. Shirai charges Viper but Viper hits a crossbody followed by a senton for a two count. Viper charges Shirai in the corner but Shirai slides out to the apron and hits a missile dropkick. Shirai goes for a sunset flip, Viper blocks it but Shirai slides away and hits another dropkick for two. Somato by Shirai and she puts Viper in an armtrap crossface, but Viper gets to the ropes. Tiger Feint Kick by Shirai and she hits a swandive missile dropkick, she picks up Viper but Viper blocks the German suplex hold. Shirai goes for a backdrop suplex but Viper lands on top of her, she goes off the ropes and hits a bodypress for a two count cover. Viper charges Shirai but Shirai hits a hurricanrana for a two count. Buzzsaw Kick by Shirai, they slowly get up as they trade elbows, a battle which Viper easily wins. Michinoku Driver by Viper, she gets on the second turnbuckle but Shirai is up and hits a palm strike. Shirai joins Viper up top and hits a Frankensteiner, and Viper rolls out of the ring. Shirai sails out of the ring with a moonsault off the top turnbuckle, she slides Viper back in and delivers the Ryder Kick, but Viper doesn’t go down. Shirai elbows Viper and she slaps her repeatedly, Shirai goes up top but Viper grabs her from behind. Shirai slides away and kicks Viper, but Viper hits a big lariat. Viper picks up Shirai and hits an electric chair slam, cover by Viper but Shirai gets a shoulder up. Viper gets on the second turnbuckle and hits the Reverse Splash, but Shirai gets an arm in the ropes. Viper goes all the way up top but Shirai avoids the body press, uppercut by Shirai and she hits a German suplex hold for a two count. Shirai goes up top and hits a moonsault to Viper’s back, she goes up top again and hits another moonsault for the three count cover! Shirai wins and is still the World of Stardom Champion. An eight match card is massive for Stardom, I wish I could have seen it unedited (maybe one day) but as it was shown the first five matches didn’t get much of a chance. Nothing was bad up to the title matches but it almost couldn’t be, when only five minutes of a match is shown it better be entertaining. Luckily all three of the title matches were shown mostly or completely in full and all three delivered. Evie/Iwatani was my favorite, just two fantastic young wrestlers, but the main event was really good also. Hojo/Garrett was a clear third place but it was solid, it just wasn’t as memorable as the other two. 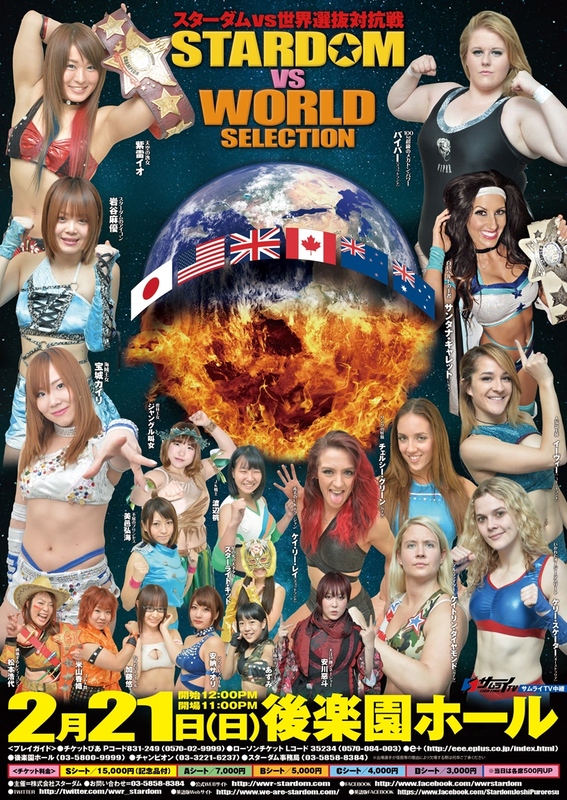 Overall an entertaining event by Stardom top to bottom, however it is probably safe to skip to the last three matches if you usually cherry pick as the first part of the card is too chopped up to recommended.